Adapted only slightly from Around my French Table by Dorie Greenspan. 2When you’re ready to bake, preheat the oven to 350°F. Line a baking sheet with parchment and put the dough between two sheets of parchment. 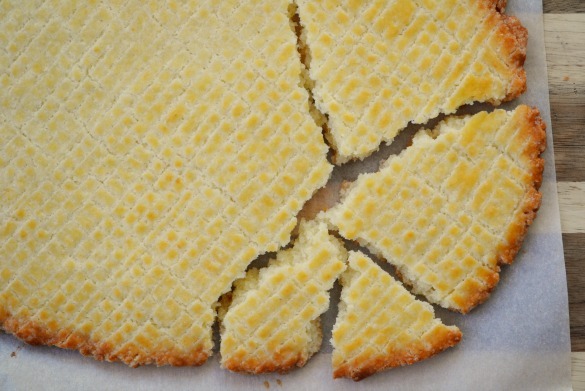 If it's very firm, you may need to bash it a bit with your rolling pin to soften it up. Roll it into a rectangle that’s about 5x11-inches. Transfer the dough to the lined baking sheet and peel off the top piece of parchment. Beat the egg yolk with a few drops of cold water and brush the surface all over. With the tines of a fork, decorate the top with a crosshatch pattern. 3Bake for 30-35 minutes, or until golden. It will be firm to the touch but will have a little spring when pressed in the center — the perfect break-up is crisp on the outside and still tender within. Transfer to a wire rack to cool. Serve it whole on a platter or cutting board, set in the middle of the table.